JANESVILLE, WISCONSIN – WARHEADS, makers of the iconic Extreme Sour Hard Candy products, brings the heat to the candy aisle with their newest innovation: HOTHEADS Extreme Heat Worms. This innovative new product takes the classic WARHEADS Worms and creates a unique flavor experience combining sour, sweet and heat. “WARHEADS is a brand known for extreme sour. We knew we needed to keep the extreme factor that people know and love, but wanted to create a product that takes sour to another level and combines it with heat. Hot and spicy products are a growing segment that is no longer just for adults, so why not bring it to candy? From there, the HOTHEADS brand was born,” says Jeff Rome, CEO of Impact Confections Inc.
HOTHEADS Extreme Heat Worms take your taste buds on a flavor roller coaster with every piece. First you get the WARHEADS mouth puckering sour, then a sweet relief of fruit flavors, and finally right as you think you are done a fiery heat sneaks up at the end. “What truly makes this product unique from other candy on the market is that it not only delivers a real heat to every piece, but the way you experience the different flavor profiles is like no other. When we say sour, sweet, then the heat, we mean it. As you eat the piece, the flavors come out layer by layer, letting you truly experience each profile,” explains Rome. 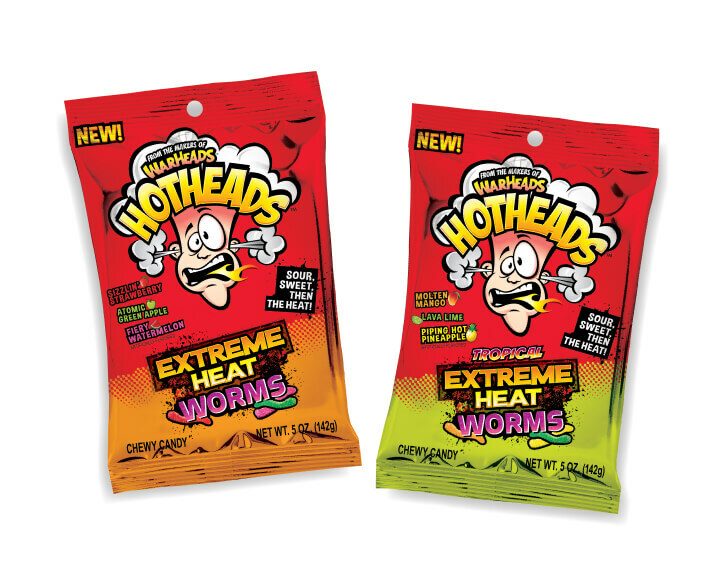 HOTHEADS Extreme Heat Worms are available in a 0.47oz snack pack size, 2 oz count good size, and 5oz and 8oz peg bag sizes with a suggested retail of $0.99 to $1.99. All sizes are offered in two flavor varieties: original, which includes sizzlin’ strawberry, fiery watermelon, and atomic green apple; and tropical, which includes piping hot pineapple, molten mango, and lava lime. These products are available starting June 1, 2017. Additionally, HOTHEADS will be offered in a variety of shippers and seasonal items.